As we all know that most of guys use social websites for generating traffic on their own websites and for generating huge traffic they use different techniques. Like Share there latest post links or Share a image and put link in description or Use image with Fake video buttons, so whenever someone clicks on that image they redirect to user websites and user(website owner) successfully achieved his/her goal. But other users cant like this techniques because user always want easiness, means users want video will play on single click and cant tolerate redirection trick. Now! Facebook breaks the heart of those user who uses above techniques for getting traffic Because "Facebook Ban Links With Fake Play Video Button". Because whenever viewer click on "Fake Video Button" viewer will redirect to the other website but keep in mind you can find same video on that website which you can see in image. 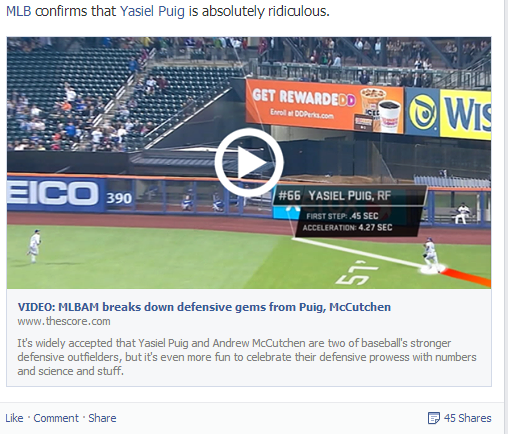 Above is the example of fake video play button whenever you click on it, redirect to the thescore website.